Synopsis: In the months after his father’s suicide, it’s been tough for 16-year-old Aaron Soto to find happiness again–but he’s still gunning for it. With the support of his girlfriend Genevieve and his overworked mom, he’s slowly remembering what that might feel like. But grief and the smile-shaped scar on his wrist prevent him from forgetting completely. When Genevieve leaves for a couple of weeks, Aaron spends all his time hanging out with this new guy, Thomas. Aaron’s crew notices, and they’re not exactly thrilled. But Aaron can’t deny the happiness Thomas brings or how Thomas makes him feel safe from himself, despite the tensions their friendship is stirring with his girlfriend and friends. Since Aaron can’t stay away from Thomas or turn off his newfound feelings for him, he considers turning to the Leteo Institute’s revolutionary memory-alteration procedure to straighten himself out, even if it means forgetting who he truly is. Why does happiness have to be so hard? This isn’t a book I would have picked out for myself. This book was a part of OwlCrate’s Diversity box, and was recieved in my first month under their subscription service. The theme of the box was Diversity and I was keen to try whatever book they had picked out for us. After reading the blurb, I was worried I wouldn’t like it as I’m not really a contemporary book fan. I tend to stay away from the genre. But I was determined to read this book. Wow. Silvera’s writing is incredible. This story was as unpredictable as it was beautiful and I think it’s best that people go into reading this book without much knowledge of what to expect so that they can get the full effect of this book. This book has stunning levels of prose and so skillfully weaves suspense and takes the reader on a journey through the plot blindly, asking for the reader’s trust. Silvera’s main character Aaron is both flawed and incredibly interesting; a POC character who grew up and lives in a tiny housing department issued flat in Brooklyn, NY. Aaron’s strength as a main character lies in his presence as an ‘every man’ ; Aaron’s the type of guy you find in your class who sits at the back and mucks around with his mates, the guy who works with you at your part time job that you say hi to every now and then. Aaron is real, so real that his story and what happens to him is all the more gut wrenching. Some people try and call this book Sci-fi but I don’t know if I would put it under that label as it doesn’t really fit. This book is definitely a contemporary book that includes one tiny sci-fi esque element. This element- the Leteo Institute- doesn’t have a strong enough presence in this book to deem it sci-fi. Yes what the institute does is technically sci-fi, but it isn’t an integral part of the story. The Leteo Institute is merely a catalyst for a self realization and used as a metaphor. I totally did not see the ending coming. It was swift, brutal and made me sob like a baby. I don’t know why I expected a happy ending- Silvera never guarantees one and he certainly alludes the whole way through that this isn’t that sort of story. Even though I cried and was shocked by the ending, in retrospect, this is literally the most perfect way for the story to end. A happy ending wouldn’t have had the impact the real ending did and would have cheapened the story. I love when books ask you to think. 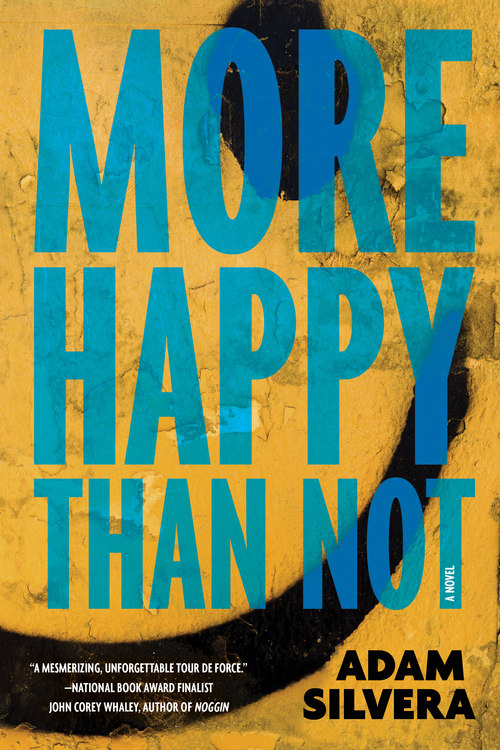 More Happy Than Not certainly does. This book is the perfect book for this current time, as it reflects a growing social issue that needs to be corrected. This book is about an average guy struggling to come to terms with his sexuality. This may offend some, but this book doesn’t aim to please the bigots. This book preaches tolerance and asks a lot of poignant questions about how society reacts to and treats gay people. For a lot of people out there, this book will have a lot of meaning. This book shows a) how hard it is to be a gay person in a poor minority strong neighborhood, but also b) teaches us how important it is to find happiness within ourselves. Silvera points out that yes, it is extremely hard to accept yourself and find peace with who you are, but that it’s so vitally important to do so. His message is much needed in light of the large social movements currently moving throughout the world, and it is a message that will probably be needed for many years to come. That being said, as much as I would like to ask everyone I know to read this book, I know a lot of people won’t and won’t ever feel the need to. Silvera’s message may fall on deaf ears, but for a large majority of readers, it’s a message taken with relish. This book belongs in this world and needed to be written. I’m not the only person singing this book’s praises. This book has a 4.23 star rating on good reads; one of the highest I’ve seen on the site. To impress the citizens of goodreads, you need to be extremely good, and Silvera definitely is. For Silvera’s debut novel, this is a phenomenal piece of writing and If this is him just beginning, I can’t wait to see what he comes up with next.